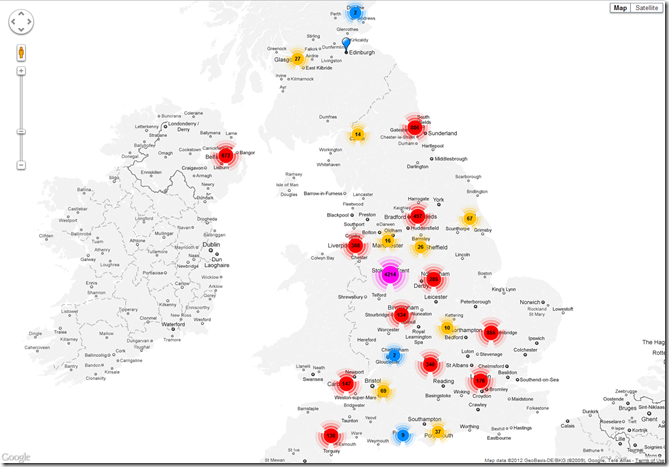 This is the final official post (a little late than expected) for the OER Visualisation Project. In this post I’ll summaries the work and try and answer the questions originally raised in the project specification. Over the course of the project there have been 17 blog posts, including this one, listed at the end and accessible via the ooh-er category. The project was tasked with two work packages: PROD Data Analysis (WP1); and Content Outputs (WP2). The nature of these packages means there is overlap in deliverables but I will attempt to deal with them separately. In the blog post on day 8 an example spreadsheet was created (which has been further developed) and shared for reuse. As part of this process an online document of SPARQL queries used in the spreadsheet was also created and maintained. Throughout the project this resource has been revisited and reused as part of other outputs. It has also been used to quickly filter PROD data. This technique of importing SPARQL data has already been highlighted by CETIS staff but to move the idea forward it might be worth considering releasing a set of prepared spreadsheets to the public. 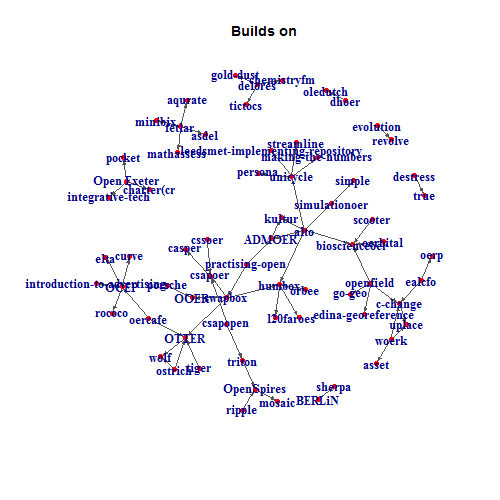 The main advantage of this is there is a steep learning curve when using linked data and SPARQL queries. Having a set of spreadsheets ready for people to use should make PROD data more accessible, allowing people to explore the information in a familiar environment. An issue to consider if promoting the PROD Datastore Spreadsheet is weather to make a live link to the PROD data or create as fixed data. For example, the mapping solutions from day 20 broke after PROD data was updated. Removing whitespace from some institution names meant that location data which was looked-up using a combination of fixed and live data failed to find the amended institution names. This is not so much an issue with PROD data but in the way the spreadsheet was developed. Consequently if CETIS were to go down the route of providing ready made Google Spreadsheets it should make clear to users that data might change at any point. Alternatively instead of providing spreadsheets with live data CETIS might consider release versions of spreadsheets with fixed results (this could be provided for programmes or strands with have been completed). Production of the static sheets could be achieved manually by uploading a collection of csv reports (sheets for project information, technologies, standards etc) or be automated using Google Apps Script. It was hoped that stored queries could be used with the Kasabi triple store but a number of issues prevented this. The main reason was the issue of exposing Kasabi API keys when using client side visualisations and in shared Google Spreadsheets. There was also an issue with custom APIs within Kasabi not working when they included OPTIONAL statements in queries. This issue is being investigated by Kasabi. No other data sets were identified. Exploring PROD data has been a useful opportunity to explore it’s validity and coverage. 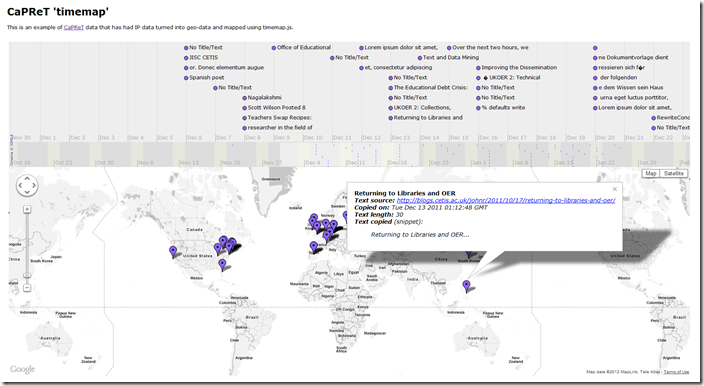 As mentioned earlier geo data for institutions, particularly for the OER Programme, is patchy (a list of missing institutions was given to Wilbert). Another observation was whitespaces on data values prevented some lookups from working. It might be worth seeing if these could be trimmed on data entry. Another consideration if CETIS want PROD data to be attractive to the data visualisation community is to natively provide output in csv or JSON format. This is already partially implemented in the PROD API and already available on some stored Kasabi stored queries using a csv XSLT stylesheet. Before I mention some of the outputs it’s worth highlighting some of the processes to get there. This generally followed Paul Bradshaw’s The inverted pyramid of data journalism highlighted in day 16 of compile, clean, context and combine. Two datasets were compiled and cleaned as part of this project: UKOER records on Jorum; and an archive of #ukoer tweets from April 2009* to January 2012 (the archive from April 2009 – March 2010 is only partial, more complete data recovered from TwapperKeeper exists for the remaining period. reconciling creator metadata to institutional names – as this data is entered by the person submitting the record there can be numerous variations in format which can make this processes difficult. Fortunately with Google Refine it was possible to extract enough data to match organisations stored in PROD data (made possible via the Kasabi Reconciliation API). extract Jorum record view counts by scraping record pages – a request was made for this data but at the time wasn’t available. 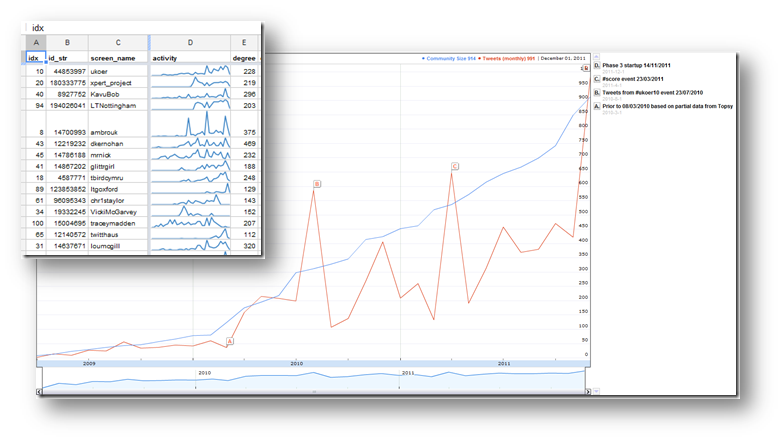 Google Refine was used to lookup each Jorum record page and parse the view count that is publically displayed. The process of extracting an archive of #ukoer tweets for March 2010 to January 2012 was more straight forward as this data was stored on TwapperKeeper. Tweets prior to this date were more problematic as no publically complied archive could be found. The solution was to extract partial data from the Topsy Otter API (the process for doing this is still to be documented). 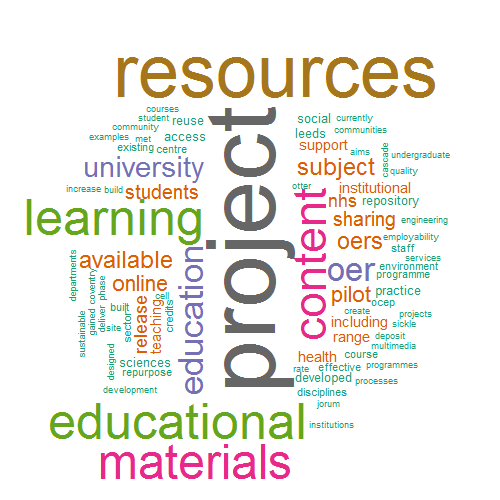 In the following sections the visualisations produced are summarised. 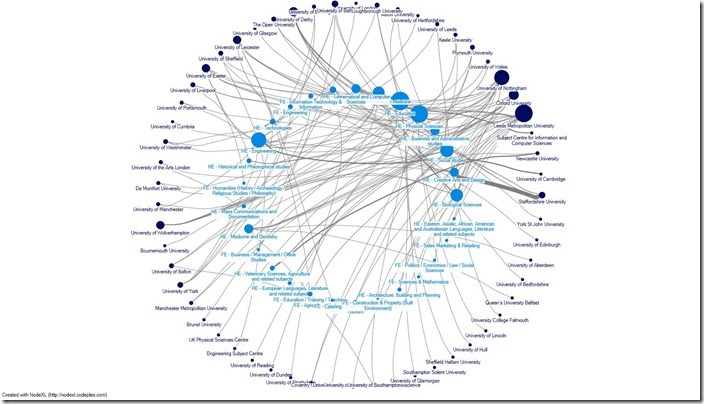 About: Generated in NodeXL this image illustrates subject deposits by institutions. Line width indicates the number of deposits from the institution to the subject area and node size indicates the number of different subject areas the institution has deposited to. For example, Staffordshire University has made a lot of deposits to HE – Creative Arts and Design and very few other subjects, while Leeds Metropolitan University has made deposits to lots of subjects. About: Creating a pivot report from the Jorum UKOER records in Google Spreadsheet, the data was then rendered using a modification of a raphaelJS library dots example. Bubble size indicates the number of records deposited by the institution per month. About: Raw CaPRéT OER tracking data was processed in Google Refine converting IP log data for target website and copier location into longitude and latitude. 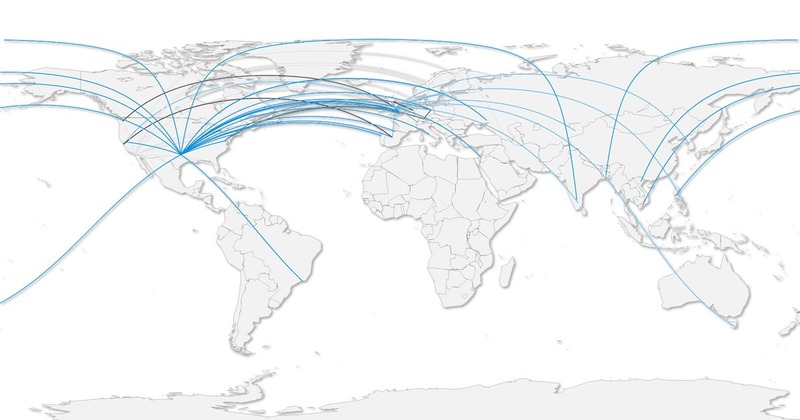 The results were then processed in R. The map uses ‘great circle’ lines to illustrate the location of the source data and the location of the person taking a copy [day 32]. About: Produced using a combination of Gephi and R ‘the heart of #ukoer’ depicts the friend relationships between 865 twitter accounts who have used the #ukoer hashtag since April 2009 to January 2012. The image represents over 24,000 friendships and node size indicates the persons weighted ‘betweenness centrality’ (how much of a community bridge that person is). 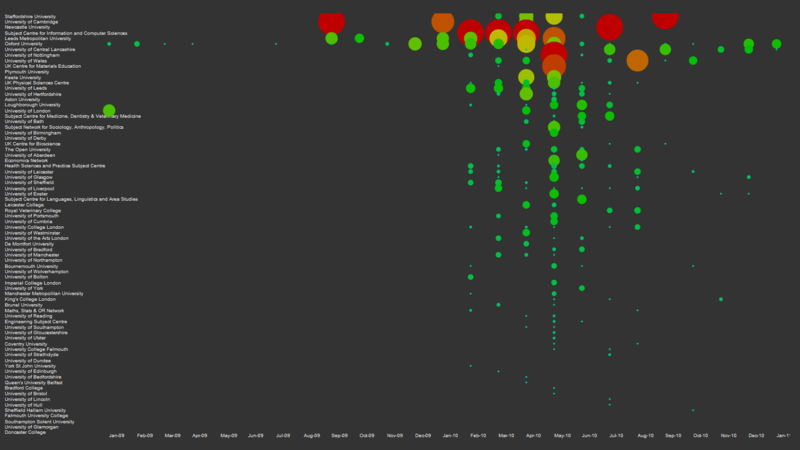 Colours indicate internal community groups (programmatically detected). The wordclouds round the visualisation are a summary of that sub-groups Twitter profile descriptions [day 37, revisited day 40]. 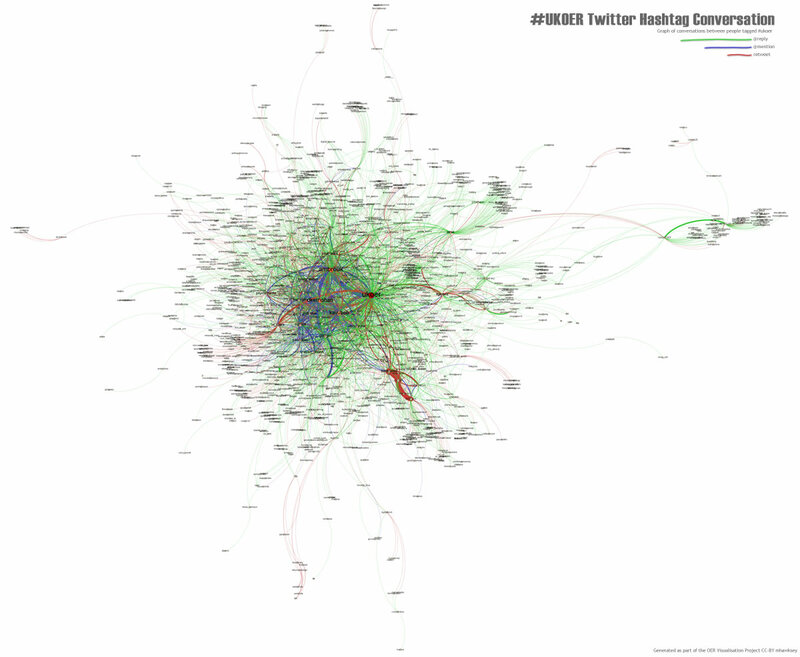 About: Produced using Gephi this image is a summary of the conversations between people using the #ukoer hashtag. 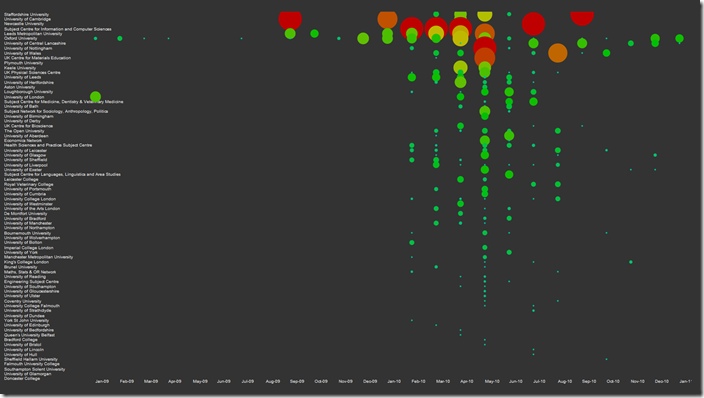 Connecting lines are colour coded with green showing @replies, blue are @mentions and red are reweets [day 40]. 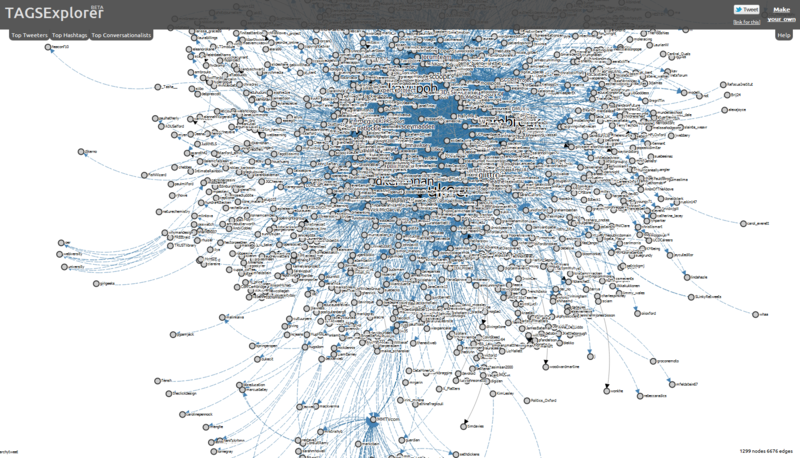 About: Using the same data from the ‘pulse of #ukoer’ an interactive version of the #ukoer twitter archive is rendered in the experimental TAGSExplorer. 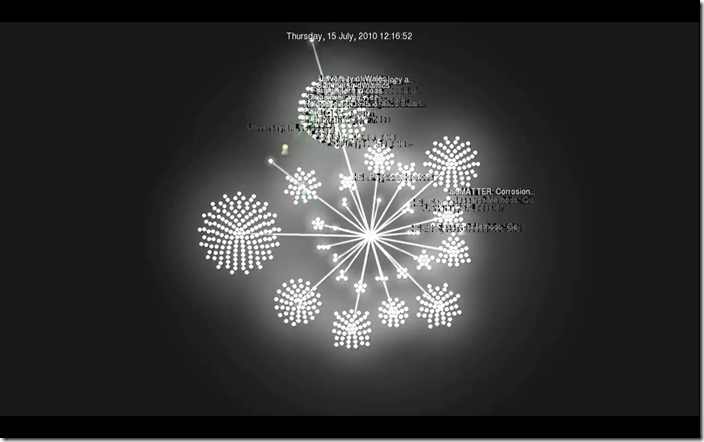 Click on nodes allows the user to see all the tweets that person has made in the archive and replay part of the conversation [day 40]. 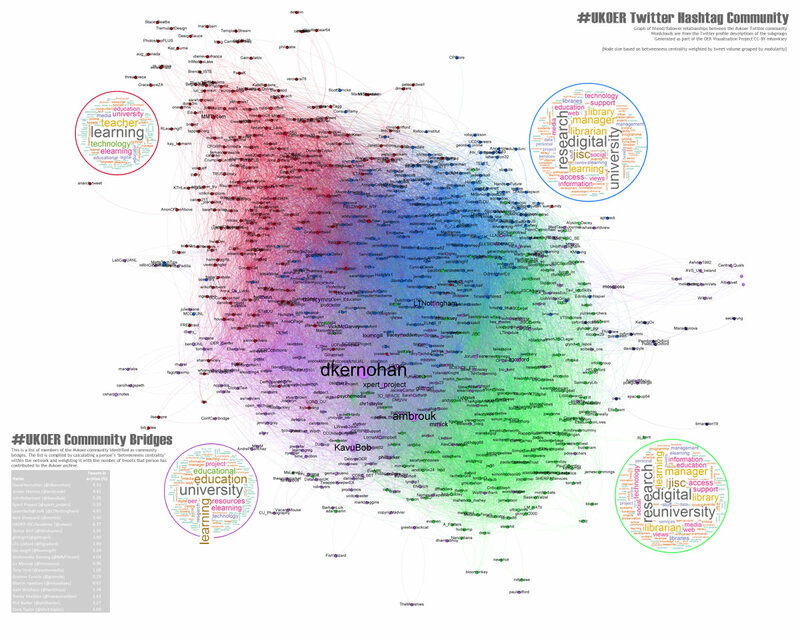 About: As part of the process of preserving #ukoer tweets a number of associated graphs used to detect the health of the #ukoer hashtag were produced. These are available in the Google Spreadsheet [day 40]. 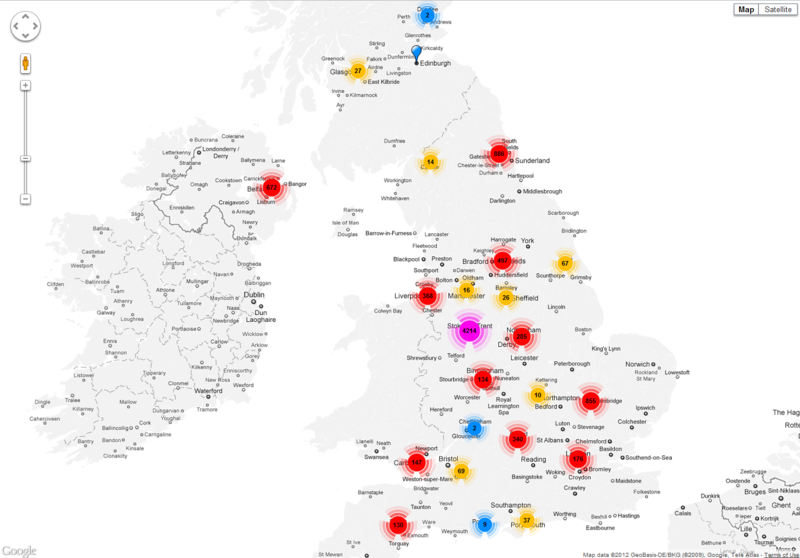 This project has mainly focused on Jorum and the #ukoer Twitter hashtag, due to time constraints as well as the amount of time required to compile a useful dataset. It would be useful if these datasets were more readily available, but I imagine this is less of a problem for internal repository analysis as data is easier to access. Towards the end of the project focus shifted towards institutional repositories, some work being done to assist University of Oxford (and serendipitously Leeds Metropolitan University). If this work is to be taken forward, and this may already be a part of the OER Rapid Innovation projects, more work needs to be done with institutional repository managers to surface the tools and recipes they need to help them continue to push their work forward. Whilst not a purposeful aim of this project it’s very fitting that all of tools and visualisation libraries used in this project are open source or freely available. This rich selection of high quality tools and libraries also means that all of the project outputs are replicable without any software costs. An area that is however lacking is documented uses of these tools for OER analysis. Recipes for extracting OAI data for desktop analysis were, until this project, none existent, and as mentioned more work potentially needs to be done in this area to streamline the processes for compiling, cleaning and communicating repository data. To help the sharing of OER data I would encourage institutions to adopted an open data philosophy including information on how this data can be accessed (the Ghent University Downloads/API page is an example of good practice). There is also a lack of activity data being recorded around OER usage. This is a well established issue and hopefully projects like Learning Registry/JLeRN can address this. It’s however worth remembering that these projects are very unlikely to be magic bullets and projects like CaPRéT still have an important role. Was this project a success? I would say partial. Looking back at the selection of visualisation produced I feel there could have been more. So much time was spent creating recipes for data extraction and analysis, that it left little time for visualisation. I hope what has been achieved is of benefit to the sector and it’s reassuring that outputs from this project is already being used elsewhere. Wow – great work and great summary. I can’t stress enough how useful it has been for us to have you look at the PROD database in this project, I know only a small part of your work, but it has been incredibly useful. As you pointed out we have started building on your work already and your recommendations will be central to future developments. I’ve really enjoyed your visualisation project. I’ve found it really interesting and lots of your posts have had really handy links or techniques that pointed me in the right direction. Really interesting stuff. 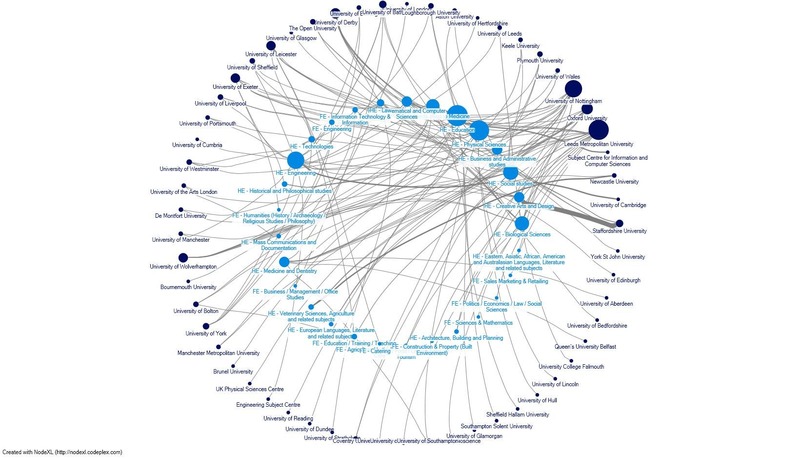 I wonder whether anyone there would be interested in working with us to develop visualizations based on the data from the OLnet OER Evidence Hub (ci.olnet.org). We have a prestigious report coming out soon and it would be really good if we could include something like this. 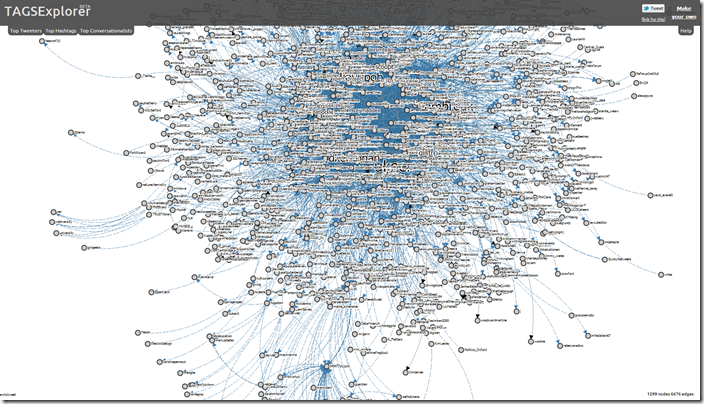 Complex data needs good visualizations!